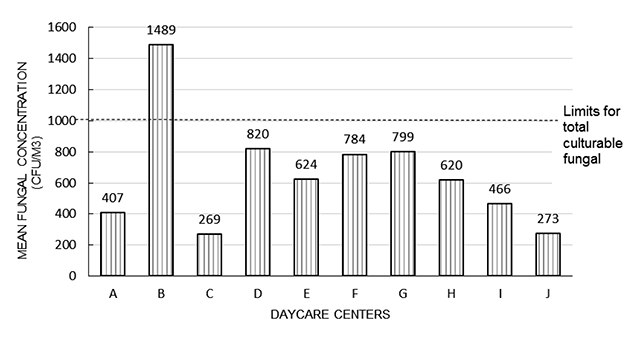 Introduction: Indoor air quality in day care centers (DCCs) is an emerging research topic nowadays. Indoor air pollutants such as particulate matter (PM) and microbes have been linked to respiratory health effects in children, particularly asthma-related symptoms such as night coughs and wheezing due to early exposure to indoor air contaminants. Objective: The aim of this study was to determine the association between wheezing symptoms among toddlers attending DCCs and indoor particulate matter, PM10, PM2.5, and microbial count level in urban DCCs in the District of Seremban, Malaysia. Methods: Data collection was carried out at 10 DCCs located in the urban area of Seremban. Modified validated questionnaires were distributed to parents to obtain their children’s health symptoms. The parameters measured were indoor PM2.5, PM10, carbon monoxide, total bacteria count, total fungus count, temperature, air velocity, and relative humidity using the National Institute for Occupational Safety and Health analytical method. Results: All 10 DCCs investigated had at least one indoor air quality parameter exceeding the acceptable level of standard guidelines. The prevalence of toddlers having wheezing symptoms was 18.9%. There was a significant different in mean concentration of PM2.5 and total bacteria count between those with and those without wheezing symptoms (P = 0.02, P = 0.006). Conclusions: Urban DCCs are exposed to many air pollutants that may enter their buildings from various adjacent sources. The particle concentrations and presence of microbes in DCCs might increase the risk of exposed children for respiratory diseases, particularly asthma, in their later life. The quality of indoor air has become an increasing public health concern because most people spend 70%–90% of their time indoors, particularly children. The complex mixture of air pollutants, including particulates, gaseous materials, and microorganisms, affects young children, who are more sensitive to indoor air quality (IAQ) due to their immature immune systems, greater inhaled breath per unit mass, breathing zone nearer to the ground, and rapid growth . Most Malaysian parents who are both working send children as early as three months old to day care centers (DCCs) established by the government or private agencies. They may spend eight hours per day, five days per week in DCCs, and some even spend over 10 hours per day, depending on the time they arrive at and leave the center . Hence, it is substantially important that good IAQ be established in DCCs. Early exposure to indoor air pollutants among children attending DCCs might increase the risk of allergies and asthma [3, 4]. Although no definitive proof exists, day care attendance was found to be a risk factor for asthmatic symptoms—usually wheezing and night cough, especially among children less than five years old [5, 6]. In a recent study, indoor particulate matter (PM) with aerodynamic diameter of 2.5 mm (PM2.5) were found to be associated with wheezing and night cough in asthmatic children . Young children who are exposed to ultrafine particles have increased risk of respiratory infection, especially those who have asthmatic symptoms . In addition to indoor particles, bioaerosols such as airborne bacteria and fungus are also associated with respiratory symptoms among children. High exposure to toxic-irritant complexes produced by fungi and bacteria are associated with increased occurrence of symptoms suggestive of asthma in young children [9, 10]. Risk factors in DCCs such as inadequate ventilation, various indoor materials, high occupancy, and humidity  expose children to various levels of indoor air pollutants. This study aimed to determine the association between indoor particulates and airborne bioaerosols at Malaysian DCCs in urban areas and asthmatic symptoms among toddlers one to four years of age. This cross-sectional study was carried out in the District of Seremban in Negeri Sembilan, Malaysia. Seremban is an urban and industrialized area  located in the south of the country, about 54 km (33 miles) from Kuala Lumpur, the capital city of Malaysia (Figure 1) . 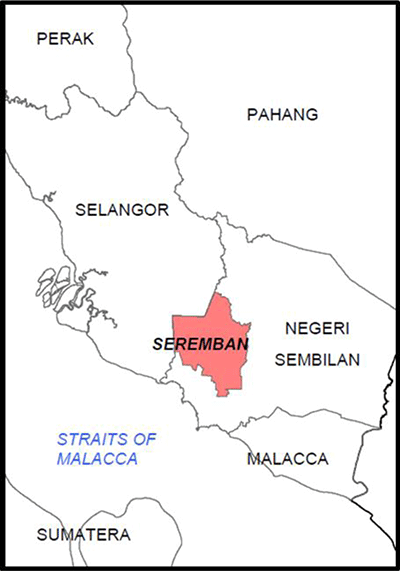 Location of Seremban District, Negeri Sembilan. (Adapted from Shamsuddin and Yaakup ). A total of 40 out of 80 registered DCCs in the district of Seremban agreed to participate in this study. The list of DCCs was obtained from the Welfare Departments of the District of Seremban. The owners of the DCCs were contacted via phone and told about the study. Written informed consent was obtained from the participants. Of 40 DCCs, only 10 had mechanical ventilation (air conditioning); these were chosen as controls. The respondents from the 10 DCCs were selected by a simple random sampling method with several inclusion criteria, namely children aged one to four years who were healthy, free from any respiratory illness, and had attended the same DCC for at least six months. The names of the children were obtained from the teachers. A set of questionnaires was given to parents to obtain information regarding respondent characteristics, and a set of questionnaires was given to the owners of the DCCs to get information regarding the characteristics of the associated buildings. Teachers at DCCs were trained to distribute questionnaires to parents of the children and to collect the completed surveys. Researchers then collected the completed surveys from designated teachers and entered them into a database for further analysis. Other factors: breastfeeding, total duration of daycare attendance, age first entering DCC, environmental tobacco smoke exposure, vehicle used to go to DCCs. Several air-monitoring instruments were used to conduct IAQ assessment in this study. Physical, chemical, and biological parameters were assessed. For physical parameters, temperature, relative humidity, air velocity, and particulate matter PM2.5 and PM10 were measured; for chemical parameters, carbon monoxide (CO) and carbon dioxide (CO2) were measured; and for biological parameters, total bacterial count (TBC) and total fungus count (TFC) were measured. The monitoring instruments used were a TSI 8520 DustTrak Airborne Particle Monitor for PM2.5 and PM10; Q-Trak Plus Model 8554 Monitor for CO2, CO, relative humidity, and temperature; and TSI Velocicalc Plus Model 8386 for air velocity. The instruments were placed at the height about 0.6–1.5 m above the floor, near the level of the children’s breathing zone. The instruments were placed in an area not closer than 1 m to a wall, door, window, or active heating system. Instruments for particulate matter assessment were used based on real-time monitoring while the measurements of CO2, CO, temperature, relative humidity, and air velocity were taken periodically and spread throughout many areas in the building so that the coverage was distributed evenly. The indoor air parameters were measured in the playroom at a time when most of the children occupied the room. The children are in the playroom most of the time in almost all DCCs; the playroom was also used for children to take their nap and rest. The outdoor air parameters were measured concurrently with the indoor air parameters. The time of measurement was from 8:00 AM to 5:00 PM, during the DCC’s operation hours. All the samples were taken during the hot season, with minimal change in temperature and weather within the six-month period (January to June, 2014), and no renovations or painting activities were carried out at any DCC during the sampling. Statistical analysis was carried out using SPSS version 21.0. To determine the predictors of wheezing symptom among children; simple and multiple logistics regressions were used. A P value < 0.05 was considered significant for all analyses. The results in Table 1 show the characteristics of respondents from the 10 DCCs investigated. The majority of them were from middle-income families and lived in terrace-type houses. Most of them had early exposure to DCC, starting at less than one year of age, and had an average duration of stay in the DCC of 1–3 years. Less than 20% of the respondents had family history of asthma or food allergy; however, most of them were exposed to environmental tobacco smoke at home. Most parents had a high education level—bachelor’s, master’s, or doctorate level. Sociodemographic Characteristics of Respondents and Wheezing Symptoms (n = 90). DCC = day care center; ETS = environmental tobacco smoke; SD = standard deviation. † Significant level at P value < 0.05. From the results, there was a significant association between parental education level and wheezing symptoms (X2 = 8.515, P = 0.004). Age the children first entered the DCC, duration of day care attendance, and household income were also significantly associated with wheezing symptoms (X2 = 6.852, P = 0.037; X2 = 4.565, P = 0.012; X2 = 21.194, P < 0.001). However, type of house, pets at home, and residences located near major road had no significant association with wheezing symptoms. A majority of the DCC buildings were more than 10 years old, as tabulated in Table 2. Nine of the DCCs were located in residential buildings while one was located in a commercial building. Seven of the DCCs were run by private agencies and three were run by the government. All DCCs were located in an urban area in the Seremban district. Mechanical ventilation was used by each of the selected DCCs. All centers were cleaned daily by mopping and/or vacuuming. Sampling Sites and Environmental Conditions of 10 Air-Conditioned DCCs in Seremban District, Negeri Sembilan. DCC = day care center; R.H. = relative humidity; SD = standard deviation; Temp = temperature. *Indicates that center near to pollution source. The symptom assessed in this study was wheezing, identified using the adapted and validated questionnaires from the International Study on Asthma and Allergy in Children. The questions discussed wheezing, night cough, child waking up from sleep due to symptoms, child ever received any nebulizer treatment, admittance to ward, and diagnosis of asthma by physicians. Table 3 shows the prevalence of health symptoms among children from each DCC. Prevalence of Health Symptoms and Severity of Symptoms Among Respondents in 10 DCCs (n = 90). DCC = day care center. A total of 160 air samples were collected for assessment of bacterial and fungal counts, and 30 samples were collected to assess the PM2.5 and PM10 levels (Table 4). In this study, it was found that the mean PM2.5 level was higher in the bedroom area (113.21 ± 103.52) compared with that in the playroom area (69.35 ± 47.61). The indoor PM10 level was not much different from the outdoor PM10 level (81.11 ± 45.29 vs. 79.61 ± 43.69). For bacterial and fungal counts, it was found that the highest mean for both were inside the bedroom area (754.80 ± 326.22 and 699.68 ± 385.61) compared with that in the playroom area (566.63 ± 359.03 and 643.25 ± 312.09). For bacterial counts, the indoor mean level was three times higher than outdoor mean levels, whereas for fungal counts, there was no difference between the indoor and outdoor levels (Table 5). Sampling Point and Number of Air Samples of the Investigated DCCs. DCC = day care center; No. = number; PM = particulate matter; TBC = total bacterial count; TFC = total fungus count. Mean and Standard Deviation of IAQ Parameters from the Investigated DCCs. DCC = day care center; IAQ = indoor air quality; ICOP = Indoor Air Quality Code of Practice; NAAQ = National Ambient Air Quality; PM = particulate matter; SD = standard deviation; TBC = total bacterial count; TFC = total fungus count. The indoor air levels were compared with the IAQ guidelines from the National Institute of Occupational Safety and Health, Malaysia  for bacterial count, fungal count, and PM10 levels, whereas PM2.5 levels were compared with the National Ambient Air Quality guidelines from Environmental Protection Agency (United States) or USEPA 2010, since the standard guideline for PM2.5 is not yet available in Malaysia. It was found that almost all DCCs had at least one IAQ parameter that exceeded the acceptable levels. The results in Table 6 show that DCC B had three IAQ parameters exceeding the acceptable levels, namely PM2.5, TBC, and TFC. Most DCCs had PM2.5 levels above the standard guideline, and half of the DCCs had bacterial counts exceeding acceptable levels. The bar graphs in Figures 2, 3 and 4 show IAQ parameters in each DCC that exceed the acceptable levels. The NIOSH has set 1000 CFU/m3 as an acceptable level for airborne bacteria and 500 CFU/m3 for culturable count of total bacteria. The acceptable level for PM10 is set as 150 μg/m3 while, for PM2.5, the acceptable level is set at 35 μg/m3 by the National Ambient Air Quality Guideline . Mean Concentrations of Indoor Air Quality Parameters at 10 Air-Conditioned DCCs Investigated in the District of Seremban, Negeri Sembilan. CFU = colony-forming unit; DCC = day care center; PM = particulate matter. ‡ Exceeded the acceptable level. Comparison of PM2.5 and PM10 levels in each of the DCCs investigated. Abbreviations: CFU = colony-forming unit; DCC = day care center; PM = particulate matter. Comparison of TBC levels in each of the DCCs investigated. Abbreviations: CFU = colony-forming unit; DCC = day care center; TBC = total bacterial count. Comparison of TFC levels in each of the DCCs investigated. Abbreviations: CFU = colony-forming unit; DCC = day care center; TFC = total fungus count. The association between IAQ parameters in DCCs and the prevalence of wheezing was established using the mean value. A significant association was observed between wheezing and indoor PM2.5 concentration in DCCs (P = 0.050, 95% CI = –37.71, –0.19), whereas no significant association was found with indoor PM10 (Table 7). For indoor bioaerosols, there was a significant association between wheezing and indoor TBC in DCCs (P = 0.020, 95% CI = –341.38, –30.41); however, no significant association was found with indoor TFC. No significant association was noted between wheezing and other IAQ parameters, namely carbon dioxide, temperature, and relative humidity. There was also no significant association between the DCC status (acceptable IAQ vs. unacceptable IAQ) and the symptom of wheezing. Association Between IAQ Parameters and Wheezing Symptom Among Respondents in 10 DCCs Investigated. CFU = colony-forming unit; CI = confidence interval; DCC = day care center; df = degrees of freedom; IAQ = indoor air quality; SD = standard deviation. †P < 0.05 is significant. The regression model in Table 8 showed that the predictors for wheezing symptoms among toddlers were parent’s level of education, family history of asthma, and DCC status. Children whose parents had low education level had 1.79 higher odds of having wheezing symptoms (P = 0.035). Those with family history of asthma had 1.08 higher odds to wheeze, and if their DCC IAQ status was unacceptable, their odds for wheezing were 7.42 times higher (P = 0.040; P = 0.032). 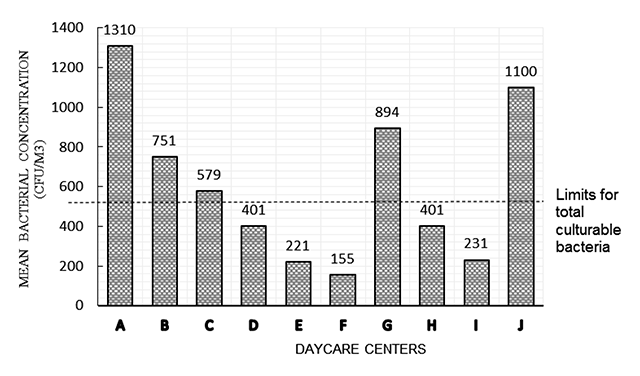 Factors Associated with Wheezing Symptoms Among Toddlers in Day Care Centers in the District of Seremban. Multicollinearity and interaction term was checked and not found. Hosmer-Lemeshow test, (P = 0.300). Classification table (overly correctly classified percentage = (69.3%). Ngelkerke R2 = 0.28. DCC = day care center; ETS = environmental tobacco smoke; LR = logistic regression; OR = odds ratio. * Forward LR multiple logistic regression model was applied. † Significant level at p < 0.05. IAQ parameters were measured in 10 DCCs in this study. DCC B had the highest concentrations of PM2.5 (174 μg/m3), TBC (751 CFU/m3), and TFC (1182 CFU/m3). It was found that the DCC B building was more than 10 years old; it was run by a private agency and located near a major roadway. The prevalence of wheezing symptoms among the respondents was also the highest in DCC B, with 12 of 14 respondents reporting symptoms. The major contributors to the high level of indoor PM2.5 and PM10 were the indoor and outdoor combustion activity as well as the location of the DCCs. Some of the DCCs in private residential buildings had a kitchen in the building. Cooking was done inside the building, which might have led to higher concentrations of PM2.5 in these DCCs. According to Kamens et al. , indoor cooking can generate particles having a diameter <0.1 μg/m3, which accounted for 30% of the particle’s volume. Previous studies have shown that the outdoor particle pollution related to road traffic can cause ambient particulate pollution, especially fine particles, in buildings located near major roadways [19, 20]. Dust generated from paved or unpaved roads as outdoor sources might also contribute to high levels of indoor particulate matter. A study in Bangkok, Thailand, revealed that indoor particulate matter concentration, mainly PM2.5, appeared to be high in buildings located in urban areas or close to motorways . A study by Chua et al. at a preschool also found high concentration of PM2.5 (112.62 ± 32.82 μg/m3) in an urban area. The levels of indoor particulate matter and microbial count depend on several variables such as temperature, relative humidity, air movement, number of occupants, activities, and ventilation . The concentration of particulate matter or dust was associated with microbial level because dust acts as medium for microbial growth . This explains why some of the DCCs with high bacterial and fungal counts also had particulate matter concentrations exceeding the acceptable level. This study found that total bacterial counts exceeded acceptable levels in half of the DCCs surveyed. Human activities such as cleaning and cooking, as well as children’s activities, could be a major source of bacteria in DCCs . In this study, it was found that the total bacterial mean concentration was 566.63 ± 359.03 CFU/m3 in playroom areas and 754.80 ± 326.22 CFU/m3 in bedroom areas. A Korean study of 10 DCCs revealed that indoor total bacterial count ranged from 645.3 ± 49.0 CFU/m3 to 898.5 ± 86.5 CFU/m3, slightly higher than in our study. In Malaysia, the recommended level established by NIOSH for the culture count of total bacteria should not exceed 500 CFU/m3 . However, it is impossible to propose an exposure limit to pathogens because information on the dose-response relationship and epidemiological data are not sufficient . Children, especially toddlers, are particularly sensitive to air pollution from various sources such as dust, particulate matter, bioaerosols, etc. ; it can increase susceptibility of children to respiratory infections and aggravate health problems related to heart and lung diseases such as asthma . The prevalence of wheezing among the respondents in this study was 18.9%. Studies done at DCCs in urban areas of Kuala Lumpur and Selangor showed the prevalence of 11.4% for wheezing and 36.2% for cough in Kuala Lumpur  and 32.8% for wheezing and 34.4% for night cough in Selangor . This study revealed a significant association between wheezing and indoor PM2.5 level as well as TBC. A study by Nazariah et al. showed a significant association of indoor fine particles with cough (OR = 1.81, CI 95% = 1.18–2.79) and wheezing (OR = 5.43, CI 95% = 2.21–13.37). A study by Mohd Nor Rawi et al. at preschools also revealed significant association between wheezing symptoms and indoor PM2.5 . The long-term effects of PM2.5 particles on children include lung function changes and development of chronic respiratory disease. A study by Sonnenschein-van der Voort et al. suggests that long-term exposure to higher levels of traffic-related air pollutants such as PM2.5 was associated with increased risk of wheezing in the first three years of life. In another study, there was an association between indoor PM2.5 and overall wheezing until eight years of age . In DCCs, children’s activities such as talking, sneezing, coughing, walking, washing, and toilet flushing can generate airborne biological particulate matter . Biological contaminants such as bacteria and fungi can trigger allergic reaction, including hyperactive airway disease, allergic rhinitis, and asthma . Bacteria are believed to have harmful effects due to endotoxin production, which can induce inflammation of the airways, increase bronchial hyperactivity, and elicit asthmatic attacks, and this endotoxin is normally shed by bacteria found in household dust . In this study, there was a significant association between asthmatic symptoms and bacterial count concentration (P = 0.020, 95% CI = –341.38, –30.41). A study in Bangkok showed that domestic endotoxin levels were associated with the frequency of wheezing episodes in asthmatic children , and a study of indoor air microbes and respiratory symptoms among school children showed a significant association between endotoxin levels and night cough symptoms, with a prevalence of 16% . Despite this, some researchers believe that microbial exposure in early life might protect children from developing atopy and allergic asthma; however, this mechanism is still not well understood . In this study, all DCCs used mechanical ventilation (air conditioners). From Table 5 it can be seen that, for the playroom area, the indoor PM2.5 level was slightly lower than the outdoor level (69.35 vs. 70.11), while PM10 level was slightly higher than the outdoor level (81.11 vs. 70.11). However, indoor TBC and TFC concentrations were higher than outdoor concentrations. For the bedroom area, all of the parameters had higher mean concentrations indoors compared with those outdoors. A study in Singapore by Zuraimi et al. at 104 DCCs revealed the same results whereby indoor particulate matter and bioaerosols had higher concentrations compared with those outdoors. This study also found that air-conditioned centers have significantly lower air-exchange rates than naturally ventilated centers. The air-exchange rates will affect the penetration of the outdoor pollutants . Most domestic air conditioners have no fresh intake, and this could affect the IAQ of the area significantly . These ventilation inadequacies in particular failed to dilute pollutants generated by the occupants such as human-related bacterial levels, resulting in higher concentrations of pollutants indoors compared with those outdoors . However, a recent study suggests that opening windows and using air purifiers may help to reduce the indoor air pollutant level . This study provides data regarding the levels of IAQ parameters in urban DCCs. Findings from this study indicate that exposure to poor IAQ and increasing levels of indoor air pollutants were associated with respiratory symptoms, particularly wheezing, among toddlers in DCCs. The indoor particle concentrations and presence of microbes in DCCs might increase the risk in exposed children for respiratory diseases, particularly asthma, later in life. It is suggested that DCC management, parents, and the public be educated and that a conducive environment, with safe IAQ, be developed in DCCs to protect children’s health. The authors would like to thank the National Institute of Occupational Safety and Health (NIOSH) for their technical support and valuable assistance in completing this research. We also would like to express our heartfelt appreciation to the management of the day care centers who participated in the study as well as the parents of the respondents for their cooperation. This research was funded by a PPUKM Fundamental Grant (Project Code: FF-2015-005), without which the study would not have been possible. The World Health Report. Make Every Mother and Child Count; 2005. http://www.who.int/whr/2005/en/. Accessed August 16, 2015. Nafstad P, Magnus P and Jaakkola K. Early respiratory infections and childhood asthma. Paediatrics. 2004; 106: 3. Herrera AB, Rodriguez LA and Niederbacher J. Biological pollution and its relationship with respiratory symptoms indicative of asthma, Bucaramanga, Colombia. Biomedica. 2011; 31: 353–371. Maulan S. Seremban Urban Park, Malaysia: A Preference Study; 2002. http://hdl.handle.net/10919/33099. Accessed September 14, 2015. Shamsuddin S and Yaakup A. Predicting and simulating future land use pattern: A case study of Seremban District. J Alam Bina. 2006; 9: 23–7. Norzila MZ, Haifa AL, Deng L, et al. Prevalence of childhood asthma and allergy in an inner city Malaysian community: Intra-observer reliability of two translated international questionnaires. Med J Malaysia. 2000; 55: 33–9. NIOSH. NIOSH bioaerosol sampling (indoor air) method: Bioaerosol sampling (indoor air). NIOSH Manual of Analytical Methods. 4th ed. Atlanta, GA: Centers for Disease Control; 1998. NIOSH. Indoor Air Quality Code of Practice (ICOP), NIOSH 2010. http://www.dosh.gov.my. Accessed November 12, 2015. EPA. National Ambient Air Quality, US EPA 2010. https://www.epa.gov/criteria-air-pollutants/naaqs-table. Accessed September 15, 2015. Chua PC and Juliana J. An overview of indoor air quality and its impact on respiratory health among Malaysian school-aged children. Reviews on Environmental Health. 2015; 30: 9–18. Luksamijarulkul P, Ratthanakhot Y and Vatanasomboon P. Microbial counts and particulate matter levels in indoor air samples collected from a child home-care center in Bangkok, Thailand. J Med Assoc Thai. 2012; 95(6): S161–8. Giardino NJ. Summary of currently available guidelines for fungal levels in indoor spaces. IEQ review. 2004; 5: 232.
WHO. Air Quality Guidelines; 2010. http://apps.who.int/iris/handle/10665/107335. Accessed December 23, 2015. Mohd Nor Rawi NA, Jalaludin J and Chua PC. 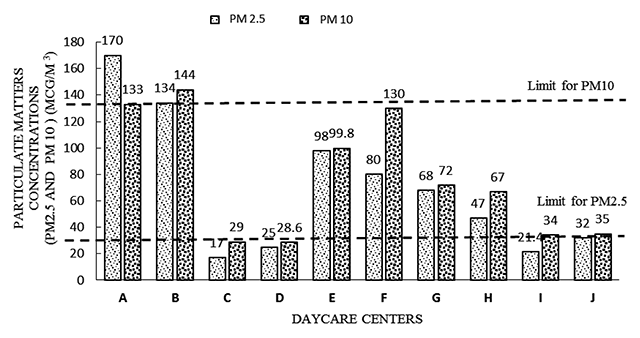 Indoor air quality and respiratory health among Malay preschool children in Selangor. Biomed Res Int. 2015; 2015. Douwes J, Thorne P, Pearce N, et al. Bioaerosol health effects and exposure assessment: Progress and prospects. Ann Occup Hyg. 2003; 47: 187–200.